One of the delights of travelling in southern Spain is the architectural contrast caused by repeated waves of Arab and Christian colonisation. For instance, the Arabs might hold sway for a few hundred years, incorporating pre-existing Roman stones into their mosque. Then the Christians might arrive, knock down the mosque, and use not only the pre-dressed stone but also enslaved Arabic stone masons to rebuild a cathedral. Of course, the Arab stone masons only know how to build in their own style, they know nothing of Gothic architecture, and so inevitably the cathedral gains an Arabic flavour. A few hundred years later, the Arabs might return, knock down the cathedral, enslave all the Christian stone masons, and build a mosque, with the same result. Some of the most wonderful examples of Spanish architecture, such as the Alhambra in Granada, are the product of this kind of history. 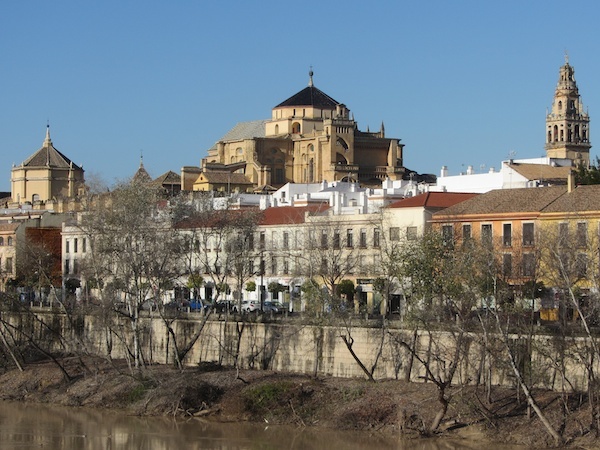 The history of the Mezquita Mosque-Cathedral in Cordoba is probably unique. 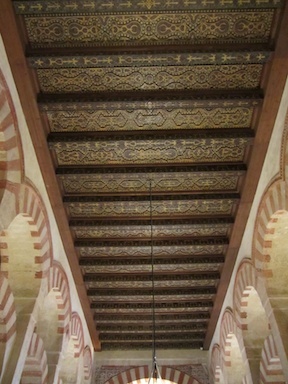 When Christians invaded the currently Arabic city, they appreciated the beauty of the current mosque, and instead of demolishing it wholesale, they decided to incorporate much of the original building into their new cathedral. They kept the outer orange gardens, and also the inner courtyard. 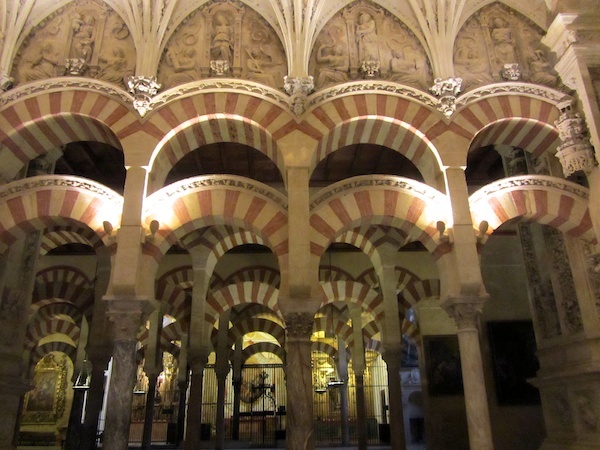 The courtyard was open to the outside world in the Arabic style, so they filled in the external arches with chapels in the Catholic style. Finding that they were unable to conduct Christian worship with all the sight-lines blocked by arches, they knocked out the centre and added a cathedral-style tower, dome and choir. The result is a gorgeous blend of the two architectural styles. 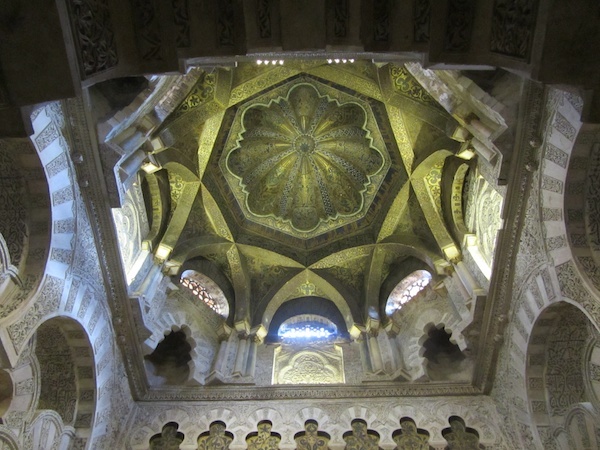 The most obvious feature of the Mezquita is the outer courtyard of double arches. The 856 columns of jasper, onyx, marble, and granite (constructed using pieces of the pre-existing Roman temple, plus others from the nearby Mérida amphitheatre) are connected with red and white striped arches. Much of the striping derives from the use of differently coloured of bricks, but in some of the outlying areas, where money was tighter, the stone has been painted instead. Either way, the result is stunning. 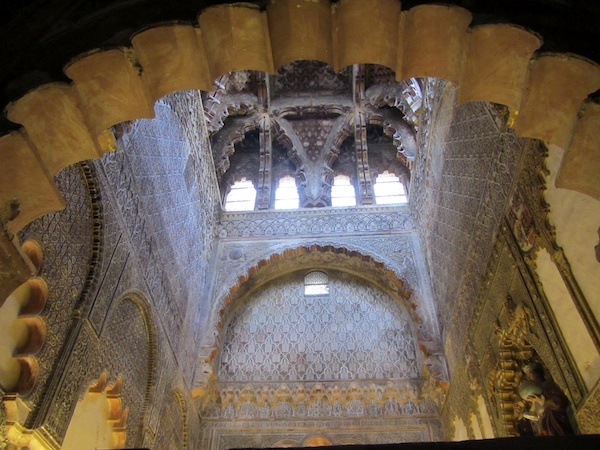 The original mosque had a really beautiful mihrab or prayer niche, which has been retained in the current cathedral. 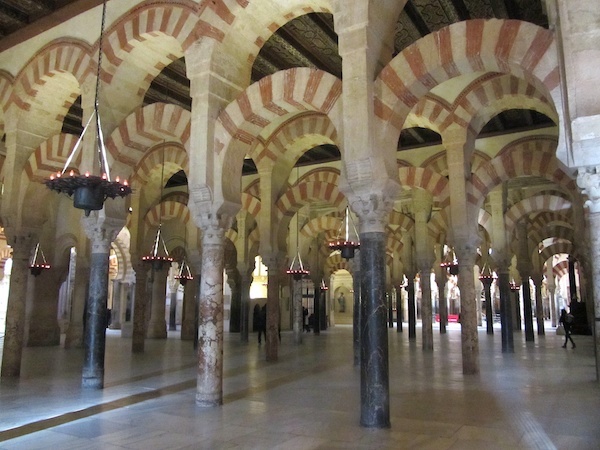 In the middle of the mosque, the Christian invaders then built the heart of a cathedral, retaining many of the original mosque’s features. Photographs don’t really do this place justice. You have to visit and soak up the ambience. A beautiful corner of the world, one of those true architectural delights. This entry was posted in Europe, Spain, Travel on 2014/01/20 by Reinhard.